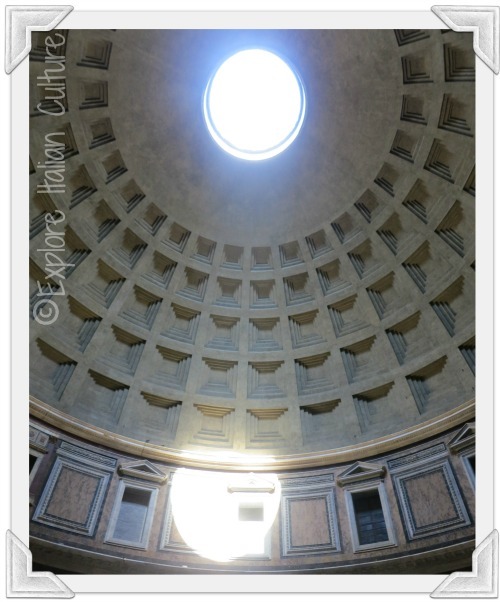 The Pantheon in Rome : an ancient momument with a modern twist. 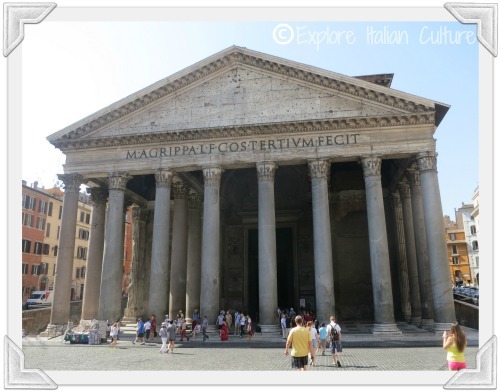 The Pantheon in Rome : an ancient building with a modern twist. 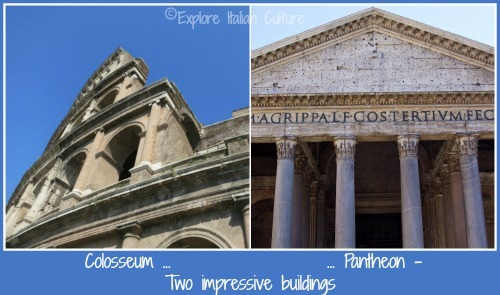 Planning to visit the Pantheon in Rome but know nothing about it? 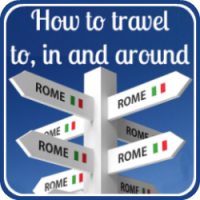 Make your visit a special one with this easy-to-follow guide. 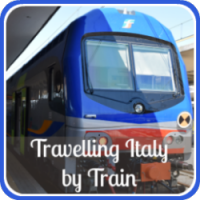 If you've visited Rome before, or even just read about it, you'll know that the city is full of so many magnificent sights that it's almost crazy to try picking a favourite. But if you back me into a corner and say "just one", I would choose the Pantheon - and once you know it you will, too. 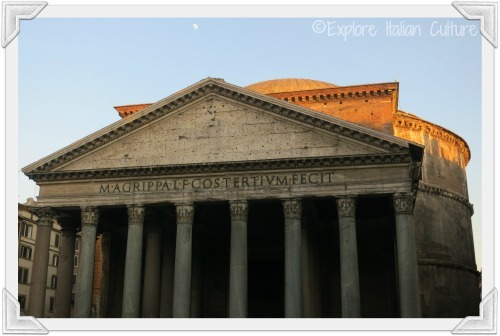 The Pantheon - stunning in the early summer evening light. Fans of the author Dan Brown may remember in 'Angels and Demons' that the Pantheon was the place a murder did not take place, despite the calculations of Professor Langdon. But if that's all you know about it, you're missing out. Let me take you there and see if you can share my view and my love. Why is the Pantheon so special? 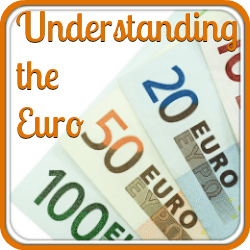 You may find yourself asking the same question I often do : "why do I love it so much?" Although it's an impressive building (you certainly don't get the Mona Lisa "Is that all?" anti-climax! ), it is not on the epic scale of Rome's Colosseum or St Peter's Basilica. And although the interior is beautiful, it's not as ornate as, for example, St John Lateran or Santa Maria Maggiore. It's ancient, but it's not as time worn and evocative of history as the Forums, the Palatine or the Arch of Titus. Perhaps that's the answer? The Pantheon is so appealing because it's on a scale that we can all take in, understand and relate to. All I know is that each time I stand inside the building underneath the oculus, the hairs on the back of my neck stand and I am awed. You will be, too. A trip to the Pantheon often follows hard on the heels of some time spent in the Piazza Navona - another place you'll love. The link is Bernini, the great sculptor. 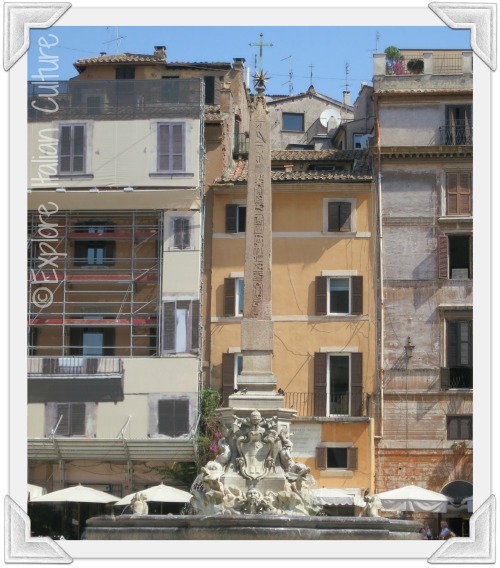 His awe-inspiring fountains in Navona are echoed in a more modest one in the Piazza in front of the Pantheon, but this one is topped by a great Egyptian obelisk. 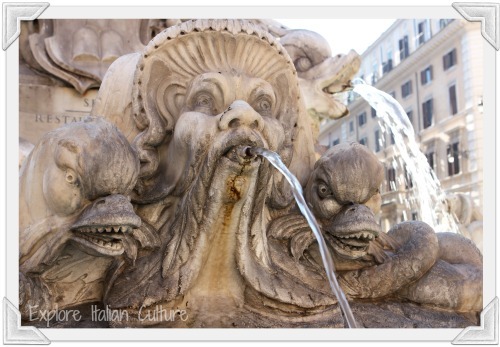 Bernini's fountain outside the Pantheon. 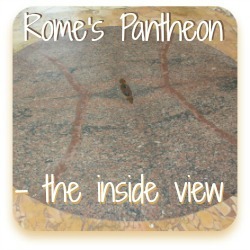 Take a minute before going into the Pantheon to have a look at it. You can also fill your water bottles here - the water, as in all the street fountains in Rome, is fresh and deliciously without chemicals. Part of the fountain outside the Pantheon. As you stand beside the fountain and look at the front of the Pantheon, what you'll see is a fairly squat, square building. It's the sort that, centuries later, Palladio would take his inspiration from. A double line of plain columns make the entrance seem a little dark, and you can't really see the dome. In fact, you might find yourself thinking - "what's all the fuss about?". Outside the Pantheon, looking from Bernini's fountain. The dome and its 'oculus'. But when you cross the door - wow! Light floods into the building through a hole at the very top of the dome - and draws your eyes up to that amazing structure. The dome is a perfect hemisphere, inlaid with regular oblong stone blocks, and it keeps your gaze moving upwards to the central hole - the oculus. 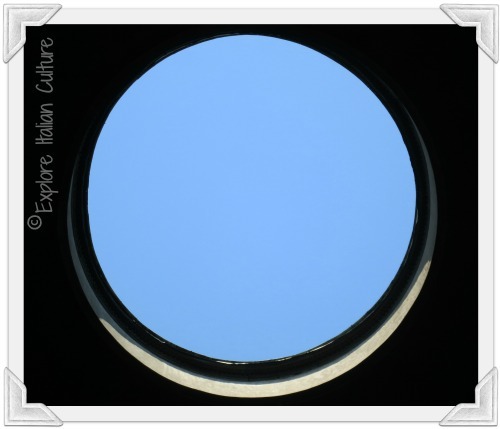 The sky in the Pantheon - first view of the oculus on a hot summer's day. The oculus is just amazing. It brings the sky into the building. That first experience is breathtaking. Take time to savour it. 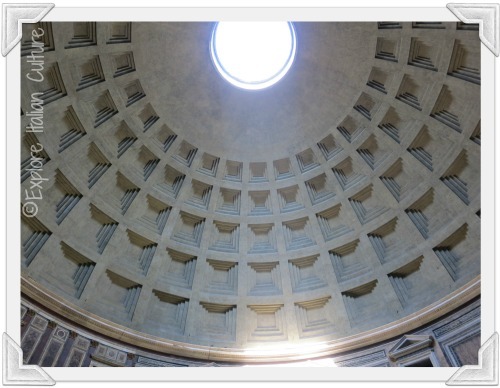 One amazing fact about the oculus in particular and the Pantheon in general is that the Ancient Roman architects planned, designed and built it so that it could be a giant clock or calendar. Like Stonehenge in England, it is laid out so that the sun falls in particular places at the same time on the same day each year. 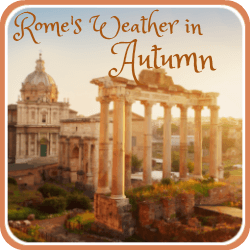 This was very useful in an age without reliable written calendars - and, of course, the Romans didn't have Rolexes! ... at a different points at different times during the day and month. Does it rain through the oculus? There used to be a myth - you may have heard it - that it never rains into the Pantheon through the oculus. This urban myth seems to have arisen from a time before electricity when the building was lit only by torch light, lamps and candles. It was thought possible that the heat coming from that light source was enough to keep the rain away, or turn it to vapour, before it hit the floor. From personal experience I can tell you that this is definitely not true! One of the great things to do in Rome when it's rainy is to stand inside the Pantheon and watch as the rain cascades through the oculus. And it's even better when it's snowing! Want to know where all the rainwater goes? 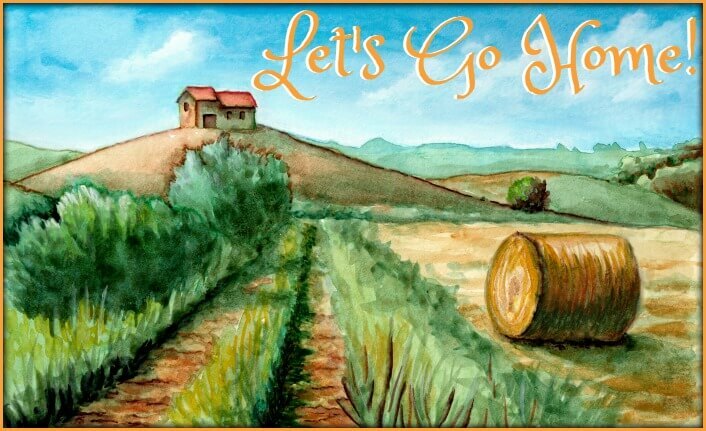 You'll need to come to our next page, where we continue our journey around the inside of the building, and cover where to find it and when to visit. Just click on the picture below to go there. PS - Do you know what this picture is? You'll find out on the next page! Just click the pic.